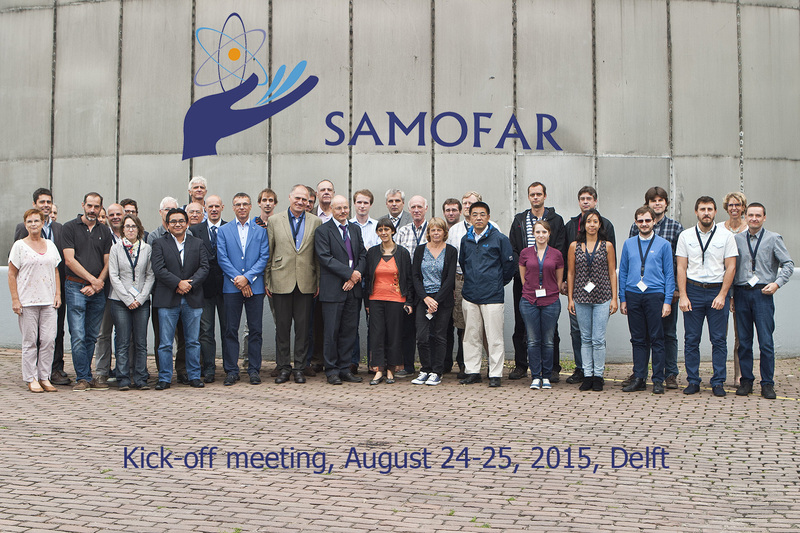 The SAMOFAR consortium comprises eleven partners each with a clear contribution to the activities. Because the Molten Salt Fast Reactor (MSFR) is a reactor design with safety features that need to be moved from low to high Technology Readiness, a major part of the work programme is fundamental of nature. This part is mainly executed by universities and research laboratories, like CNRS, JRC, CIRTEN, TU Delft and PSI, thereby exploiting each other’s unique expertise and infrastructure.CNRS is a large institute with many branches and with strong expertise on the MSFR reactor design and integral safety assessment and on experimental research with molten salts, both in the field of physics (loop experiments) and chemistry (chemical separation processes). JRC-ITU is leading in Europe with fundamental experimental research on molten salt thermo-dynamics and chemistry. It has an excellent infrastructure to investigate actinide-containing molten salts. CIRTEN has a strong reputation in experimental thermal-hydraulics and loop-dynamics as well as in numerical reactor design. TU Delft is an expert in fundamental experimental thermal-hydraulics and computational reactor physics. PSI is the leading Swiss institute on nuclear research with broad expertise, and with unique contributions to various work packages, like the structural mechanics effects of some transients. CINVESTAV is the Mexican institute with materials expertise. All academic partners also strongly contribute to the education and training part of SAMOFAR. Besides the work of fundamental nature, the input of TSO’s, industry and utilities is indispensable for their experience in reactor design and safety assessment, for the implementation of industrial standards, and for the exploitation of results. IRSN is the leading French TSO contributing strongly to the design of the integral safety assessment method. AREVA, Europe’s largest nuclear industry, will contribute their huge experience on the reactor design, safety assessment and industrial standards. KIT and EDF will contribute with the industrially adopted safety assessment code SIMMER to some specific transients. CEA is has many multi-disciplinary experts who will contribute with the complex multi-disciplinary design of the chemical plant combining chemical, nuclear, radiological and other industrial process technologies. The combined approach of the academic and industrial partners ensure the uptake of fundamental results into the industrial design processes and standards needed for the successful exploitation of the results.